Take a day off and make it a truly positive bonding experience with your kids! On November 29, 2016, the Philippine Educational Theater Association (PETA) and Save the Children will turn Rizal Park into a creative playground for parents, teachers and guardians to enjoy happy moments with children. Entitled #WeChoosePositive, this family festival will include a colorful array of activities, including a parade, workshops taught by PETA Artist-Teachers and storytelling sessions featuring Lola Basyang and Batang Lampara winners. Catch, or better yet, join the parade from Museo Pambata to Rizal Park with ‘Higantes’, lion dancers and marching band as we color the route with our declaration of support for childhood without violence. The parade begins at 2pm. Parents and teachers, if you haven’t had time to visit the Museo Pambata, now is the time to see this museum for children before joining the parade to Luneta. All these wonderful activities will begin at 2pm! Do not be mere spectators as your children explore their artistic skills. Be with them. Join the PUPPETRY AND VISUAL ARTS WORKSHOP. Make this an opportunity to discover more about how your children think and to listen to what they could not say in words but could probably say through drawings or puppets. Or participate in the MUSIC AND RHYTHM WORKSHOP and make them ‘feel the love’ as you sing and clap your hands together to your own beats. If your children have always wanted to take a PETA workshop, this will be like a sampler for them as PETA Artist-Teachers will facilitate. Play with mimes. Color art sheets. Fold papers and turn them into animated objects through the Japanese art of origami. Listen to music with upcoming OPM and PhilPOP artists or listen to Lola Basyang and other children tell stories. Sit back and relax to watch children films and videos from different parts of the globe. Have a picnic at the park. The choices are endless so you will always have something to do and enjoy. 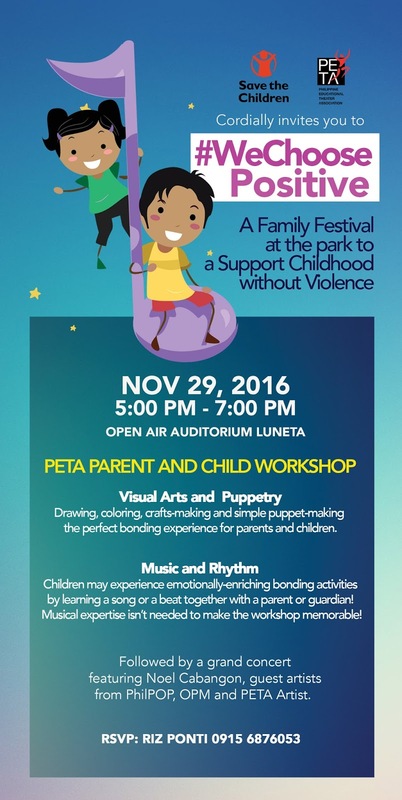 At 5pm, join us at the Luneta Open Air Auditorium and watch two short plays that drive the truth on the effects of corporal punishment. ADOBO MONOLOGUE, a one-act play that follows a boy passionately cooking the Filipino favorite adobo and slowly reveals how his late father would often beat them up as children. Written by Jason Barcial and directed by Dudz Terraña, the monologue is bound to make you laugh and leave a pang in your heart at the same time. One of the most lauded plays in the last Virgin Lab Fest, Dominique Beatrice La Victoria’s ANG BATA SA DRUM, also under the direction of Dudz Terraña, will be featured as well. Set in a home in Northern Mindanao, the play follows an after-school conversation between two siblings, one of which is literally placed inside a drum as punishment. If you weren’t able to see the play during its run, this is your chance to see it for free. Mr. Noel Cabangon will also share the stage with his son, Gab Cabangon, and his band, Kaleidoscope Eyes. This will all be punctuated with a grand fireworks display. Let’s end the day with the commitment for the more positive parenting choice of childhood without violence and a spectacular display of colors in the sky. Yes, it’s never easy to become parents. Sometimes, it’s more convenient to choose the traditional but our world has changed and it’s about time we too look for alternative choices in raising our children. We do not know of any responsible parent who would not want their children to grow up as kind and loving individuals. But getting there is quite tricky. And the methods that we use are critical. Do we really want them to fear us? Do we want to let them grow up in an environment where violence is acceptable? It’s all about choices! And on November 29, 2016, let’s choose to take the first step to making memorable experiences that they will cherish when they are older with the young ones as #WeChoosePositive! ADMISSION IS FREE for all activities. However, visual arts and music workshops have limited slots so we advice you to register in advance by calling Riz Ponti at 0915-67876053 or visiting the DUYAN or PETA Theater Center pages on Facebook and sending us a message with your name, contact information, your workshop of choice and the age of your kids. 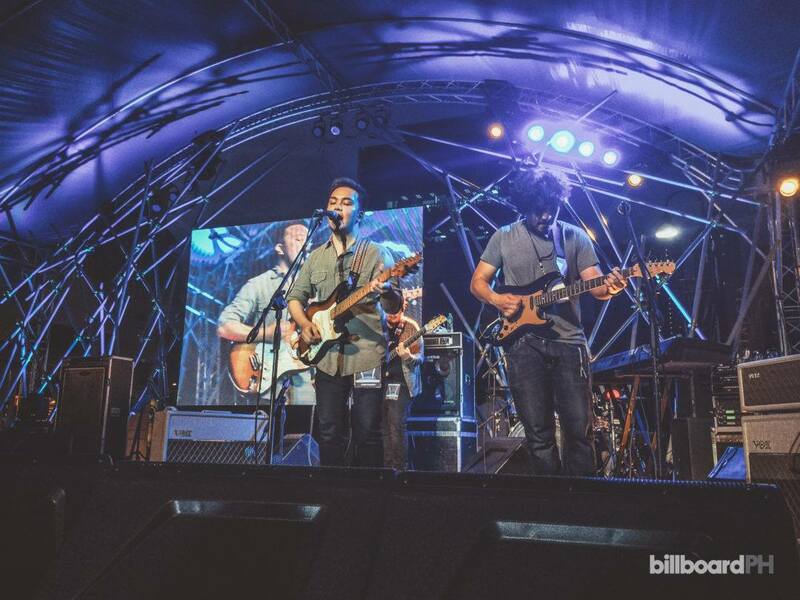 This event is also made possible with the support of PhilPOP Foundation and OPM.